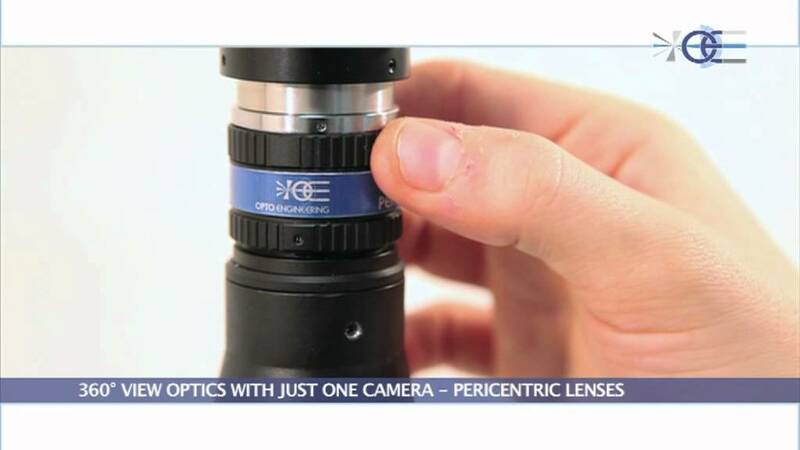 Opto Engineering PC CD are pericentric lenses exclusively developed and produced by Opto Engineering to enable the 360° side view imaging of small objects. Their innovative optical design, based on a catadioptric system, makes it possible to image small objects, with diameters as small as 7 mm. The sides of the object are imaged through the catadioptric system, while the top surface is directly imaged onto the center of the detector. The compactness and high resolution performances of these lenses make them the perfect choice for the inspection of components like pharmaceutical containers, plastic caps, pre-forms, bottle necks, screws and other threaded objects. Opto Engineering PC CD pericentric lenses can work either with 1/2 and 1/3 detectors, like standard Pericentric Lenses. The sides of the object being inspected are observed over a wide view angle, approaching 45° at its maximum; this feature makes it possible to inspect complex object geometries under a convenient perspective. The image of the external walls of the object, captured through the catadioptric system, is inscribed into the short side of the camera detector within a circular crown. On the other hand, the top of the object is directly imaged onto the central part of the detector area: both the lateral and top view of the object are in perfect focus at the same time. The optics is protected by a glass window, to prevent from the intrusion of dust and impurities into the optical system. The top of the object is imaged through a small removable window, located at the center of the lens. This optical window can be removed and replaced with other type of optics in order to compensate for the object depth, where necessary. The window’s mounting thread can also be used to host and fix a LED illuminator.